A family member bought a penthouse condo in Madrid for 600,000 Euros less than 3 years ago. Now it is valued at more than 1.2 million Euros. What’s uniquely strange to the Spanish property market is a very narrow range of prices. A condo in the worst parts of town, would still set you back atleast 5,000 Euros/m2. Strangely enough, they still haven’t gotten around to updating their legal system to allow for REITs. I was hoping that after the UK moved on this, the rest of Europe would follow suit. So if you want to invest in real estate, your only options are to actually buy property or to buy construction/property companies on the Madrid Stock Exchange. It even attracted Spain’s wealthiest man, Amancio Ortega (founder of Inditex). 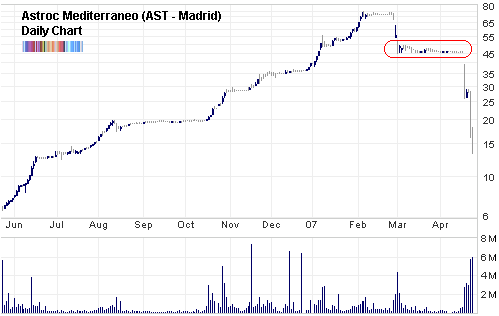 Through his investment company, Pontegadea, he bought 5% of the outstanding shares of Astroc at the beginning of 2007. And for a short time he seemed to be a genius as he doubled his money in less than a month. I don’t think he’s a happy camper now. Not that he would even notice a few million evaporating from his portfolio. As you can see on the chart, in late February 2007, instead of going up after basing for the sixth time, it actually fell quite abruptly. The party was over. Apparently some funny stuff had gone on accounting wise. There was a related party transaction involving the president and that had juiced last year’s profit making it seem much higher than it really was. The resulting fallout took out not only Astroc but all real estate companies on the exchange. And even spilled over into the wider market. It’s interesting to look at the chart and notice the beautiful stair-stepping up. How can you believe that the markets are random when you see this price action? Notice how the powers that be pinned price at 45 Euros (red rounded box). And how prices fell much faster than they rose: 7 months of climbing were undone in less than 3. This hasn’t really effected the property market itself. Although it has finally slowed, I don’t think prices will fall anytime soon. In fact, this sort of panic selling across the board is usually a good time to scoop up some shares for a bounce.